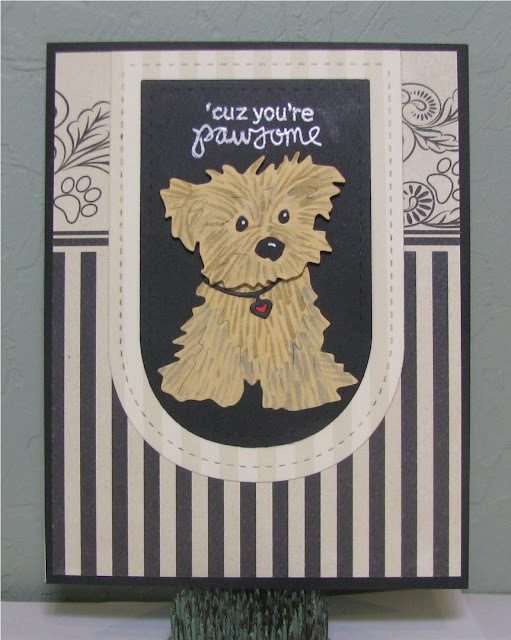 Dies: Sweet Pea (Frantic Stamper) and leash (Doggy Accessories by Frantic Stamper), colored with Copics, rounded banner (Lil' Inkers Design, but any wide banner will work). Stamp: sentiment (Terrific Terriers by Newtons Nook), Versamark Ink, white embossing powder. Paper: black & cream patterned (Devoted Collection, Authentique), black, cream stripe from stash. Make sure to enter for a chance to win that cute puppy die! Love this card. I think you chose the right rounded banner die. This just feels to me like your little doggy is stitched onto a pocket because the die looks like a pocket on a pair of blue jeans. Very cute doggy.